People wanting accountability and a decent standard of behaviour from those in public office are derided as a ‘lynch mob’. “His survival has become a matter of principle : Scotland needs political pluralism” – sorry we don’t operate our political system like that. You don’t get just to tot up Lib Dems cos it’s always been like that, or because you don’t like the SNP. Eh? Sorry that’s just clean bonkers. “Carmichael is no pal of mine, but must have a good local record since 2001 to have survived the SNP tsunami on 7 May”. Actually he had a massive majority of over 10,000 virtually wiped out. But again, it doesn’t matter if he was a good constituency MP or not, deal with the matter in hand, his smear and his lies. “Voters, who cannot bear too much truth, require it of them and only a child or a hypocrite should be unable to see this. Why, even voters tell lies. Look how so many must have lied to those trusting pollsters before the election! Should we trust the electorate now?” This is a variant on the Malcolm Bruce ‘all politicians lie so shut up’ argument, with a nice turn in blaming pesky voters thrown in. “Now I see this campaign in a more sinister light. Carmichael was one of only three non-SNP candidates to win a Scottish seat on 7 May: 56 Nats, one Tory, one Labour, one Lib Dem, that’s the Westminster contingent. He hung on by just 817 votes – 9,407 votes to SNP candidate, Danus Skene’s 8,590 – in this tiny 32,000-strong island community where there was a 23% swing, as in so many places. Ten Scots colleagues fell. So it seems a little authoritarian, to put it mildly, to seek a byelection in order to make a block of 56 MPs into 57.” Again, it doesn’t matter whether the SNP have one seat or 56, the Carmichael case is about his conduct, it has nothing to do with the SNP. “I was around in the 70s when the SNP was last present in force. As the late Alan Watkins remarked at the time, they “celebrated Hogmanay in the SNP whips office at least once a week”. It was lively.” This is just offensive stereotyping. An equivalent pejorative of English MPs would be howled down as racist. “Scotland is a divided and bruised country, says Bruce. So do others who complain of intolerance displayed by the victors of 2011 and 2015. If it’s half true it will produce a reaction. Perhaps it will start in Lerwick. I don’t know the Northern Isles but they don’t strike me as the sort of communities which go in for “Ali, Ali, Ali, out, out, out” demos.” I think you may need to check your newstream Michael, people in Orkney and Shetland are protesting already. Your patronising framing of them as a quiet rural backwater doesn’t make sense. Scotland has changed forever, and, actually we’re pretty united. “What’s more, the Northern Isles are as suspicious of Edinburgh as SNP poets are of London. Orkney voted no in the independence referendum by 67.2%.” What does this have to do with anything? 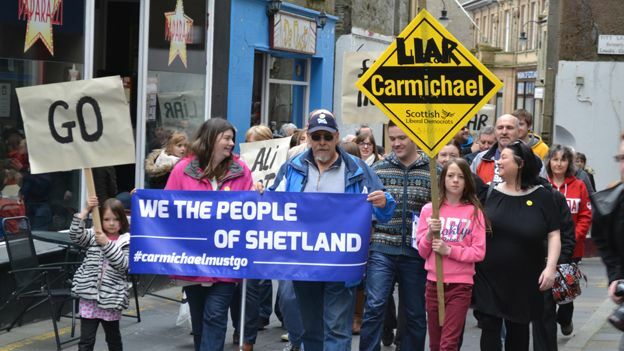 Is the implication that Orkney voted No, so Carmichael should have it as a sort of fiefdom? White is completely confused. He conflates the Yes vote with the SNP, and assumes that anyone who is against Carmichael staying in position must be the SNP. Neither is true. “Is it unreasonable to think that a Lib Dem with a good local reputation and the experience of a former Scottish secretary would be better placed to hold Sturgeon to her promises than a 70-year-old retired teacher.” Yes it is. This is just part of his narrative: ‘some people are entitled to be in politics and run the country because, er, they’ve been doing it for ages and, er, I know them’. Is the issue that Danus Skene is 70? Or that he used to be a teacher? Bizarre prejudice. We’re never told what the actual political principle is he is defending. I presume it’s “Don’t question us’? Meanwhile. back in reality, Carmichael is facing the prospect of a parliamentary standards inquiry into his behaviour, Police Scotland are looking into complaints and trying to establish whether there is any ‘criminality’ involved, and The People versus Carmichael are over 1/2 way to their target to raise a legal challenge against him. Cable matches Carmichael and Bruce inhabiting a bizarre detached sense of the world order. He writes: “The English reaction isn’t a racial thing. The prevalence of Scottish voices in our media reflects an underlying respect, liking and sense of trust.” Well actually presumably it means that you are not actively preventing Scottish people from getting jobs. Do you want a badge for that? White and Cable represent two sides of the media/parliamentary establishment, both struggling hopelessly to get their heads around some basic political realities. Yes, to White, Carmichael is the victim, not the abuser. How dare the voters complain about being lied to by their MP during a crucial election, then getting angry about it once they realise they’ve been duped? Don’t they know they’re only supposed to be allowed out once in five years, then they’re get back into their box? The Unionists demanded that Scotland come together and “heal” after the referendum. Well we did,just not in the way they wanted. The overriding characteristic of the Brit Nat is arrogance and inability to see the world in any way other than through the prism of London centricity. They used to be accepted grudgingly around the world when they had their army to keep the empire intact but are now viewed with amusement and incredulity as I am sure Cameron found out on his whistle stop tour of Europe’s movers and shakers. Cameron thinks he is going to govern the UK as “one nation” which is code for “London Tory rule for you Scots whether you like it or not”. Democracy it ain’t and we have to decide whether that continuing situation is acceptable to us or not. Meantime,it is good to see people in the Northern Isles demanding probity from their elected representative,even if it appears that is not a requisite for the current incumbent or his party. In Orkney it is true we do not get riled up easily,however, that does not mean that we will sit back and let anything happen. Being a small place we tend to know most people. When first elected Carmichael did work hard for the islands and was passionate about being a Liberal Democrat. Somewhere along the road, however, he got lost and the man we now have representing us has lost any integrity that he once had. It is extremely sad and upsetting for us. Carmichael had many opportunities during GE15 to come clean to his constituents and even when he was asked a direct question about Frenchgate at the BBC Radio Orkney hustings he continued with the deceit. Well we may be slow to react but react we have. Please support our crowd funding which will allow us to hold Carmichael to account. We are not SNP or any other group. Some of us hadn’t even met before but we are united in our determination to clean up politics in the Northern Isles. He took you for mugs and that really angers me. You loyally voted for him for fourteen years and this is how he’s treated you – as voting fodder. His sense of entitlement came across strongly in his Radio Orkney interview. He views O & S as his personal fiefdom. He’s refused to appear before or answer to committees at Holyrood as well: ‘I’m too busy’. Then he says ‘these things happen’ after the leak and brushes it off. His behaviour towards Holyrood and now towards his own voters since he became Secretary of State for Scotland has been imperious to say the least. I am also angry that his hanging on puts Tavish Scott and Liam Macarthur in a precarious position. Not very collegiate, is he? Superb comment, Fiona, thank you. There are some similarities with the reaction of British politicians and commentariat to the unrest of the American colonists in the 1760s and 1770s. They underestimated the sophistication of these people, dismissed it as a ‘peasant’s revolt’ (Boris?) that would soon blow over. We all know how that one went. Only in those days they had at least a good excuse for being so ignorant – 6000 miles of ocean and a ten week journey. Now their only excuse is hubris. He was of course referring to corruption and dishonesty and the need to rigorously challenge it rather than accept it! No you are not. You are divided. 50% of voters voted SNP – whose sole purpose is ‘independence’ for Scotland and separating Scotland from the United Kingdom (it’s in the SNP constitution, go check it out). The other 50% of voters voted for someone else. Last September you had your referendum on independence. Preceded by several years of Saltire-waving, Salmond and Sturgeon et. al spinning tales of how a Yes vote would bring about a simple, easy, seamless and smooth transition to creating a new nation, which could and would be a (insert desired utopia from a panoply of choices here) where all the contradictions and conflicts between those would be ironed out with a sweep of hubristic ‘egalitarian’ sentiment. A decent majority of Scots voted no, but nevertheless, the result was a clear split, 55% No to 45% Yes. Compare this with all other recent European continent independence referendums, where united populations voted at least +80% Yes to independence on v high often 85% or more turnouts. Those countries were United (notably, some of them are now divided). The people in Scotland are divided. You even had a 14 year old young woman write a piece on here stating that all 2 million ‘No’ voters in the referendum were ‘stupid’ ‘ignorant’ and ‘cowards’. And all the jumping up and down, stamping your feet and screaming WE ARE UNITED! WE ARE UNITED!! WE ARE, WE ARE WE ARE!!!! won’t make it any different. Clearly you’re upset, who wouldn’t be in your situation? In terms of unity I was referring to the historic election result. That’s a pretty united front. But I can tell you’re not a big Bella fan. That’s okay. I’m not upset. What ‘situation’ are you referring to? I’m perfectly happy with my current situation, thank you very much. (Through our own hard work) we have more than most, and we appreciate that. A lie. Aren’t you embarrassed? The paragraph in question referred specifically to ‘Scotland’ and your comments referred to ‘Scotland’. You are talking about the 50% of voters who voted SNP – i.e. only half of Scotland’s voters. Half of Scotland’s voters is not ‘Unity’ in or for ‘Scotland’. ‘Scotland’ is not ‘unified’ by the election result. 50% of voters voted for the SNP. Half of Scottish voters voted for the SNP, the other half voted for someone else. Electorates are very rarely if ever ‘unified’ or close to being so (except sometimes by force). However, something much closer to ‘unity’ did occur in some of the independence referendums that took place on the European continent in recent history, where some had 80%+ Yes results or higher on very high, 85% and over turnouts. “But I can tell you’re not a big Bella fan”. No, I quite enjoy this site. There are some good articles written / commented on by some very smart, informed people, who occasionally point out / prove me wrong or bring me to challenge my own understanding / perception etc. And you’re great fun, because you talk absolute rubbish all of the time. I would say that there is a much greater ‘unity’ and definitely more political awareness in Scotland since the referendum. Perhaps you do not see it as you do not live here but at no point had I ever seen 18 year olds discussing politics until now. Scotland’s turn out for the G.E was around 74%, far higher than the rest of the UK and people from both sides of the referendum debate have remained interested. The fact that over half of the population ‘united’ to send so many SNP MPs to Westminster should tell you all you need to know. Politics is divisive. The presence of parties which represent different social values is divisive. The class system is divisive. Religion is divisive. Football teams are divisive. Stop pretending that a democratic vote on our future is the one and only thing that has ever come along to ‘divide’ the Scottish people. Scottish history didn’t just end with the Act of Union, nor did it end on Sept 19th 2014. All societies exists in a perpetual state of competing interests. Get used to it. Given that, a mere seven months after the ‘decisive’ No vote, the SNP scored one of the highest election results ever recorded in Scotland and there was a massive swing away from Unionist parties. That is telling and, in a purely relative sense, a kind of ‘unity’. Sure. I’m not the one making fabricated claims about ‘Unity’ existing in Scotland, where there is none. The situation is clearly quite the opposite. I’ve said no such thing. And being Scottish, I’m well aware of and quite familiar with all the things that divide Scottish people. The Scots excel at division – its what they do, fighting and squabbling amongst themselves. And I am glad to be sufficiently far away now that I am not affected by it and do not have to endure living alongside it. Sure, I’ve no problem with that. My interests are competing very successfully. seven months after the ‘decisive’ No vote, the SNP scored one of the highest election results ever recorded in Scotland and there was a massive swing away from Unionist parties. Partly on the back of the excitement of the referendum. Watch the turnout levels revert to mean over the coming years. (I think you lost about 10% between that and the GE). In one sense, Scotland and its SNP and England and the Conservatives have something in common. Both had fights in the GE that should have been ‘stopped in the first round’ due to weak opposition. I do understand that about Scotland (just like in England): Who would vote for the Labour Party; what reason is there to vote for them; what are they there for? No it isn’t, it is no kind of unity at all. See my comments above. ‘The rose of all the world is not for me. This is not about plurality, but is necessarily exclusive, divisive and insular. My world is better than yours. It’s everything Scotland shouldn’t be, but fundamentally what the SNP are motivated by and has become the prominent driving force of the Yes indy movement. Some prefer social inclusion, compromise and common ground. SNP/ UKIP and ‘Brexit’ Tories are not so different. Dominates what? It doesn’t dominate the media, it lost the indyref and currently only carries 50% of the vote. And how can you possibly presume that Unionism – given the reactionary, right-wing forces which puppeteer it – is somehow ‘cosmopolitan’? There can’t be a chance that the SNP and its voters believe in these social issues. No, it has to be a ‘disguise’. And we’re one of them. No it isn’t. It’s proof that the SNP are a socially-progressive party. And why is wanting a country to run its own affairs inherently ‘reactionary’. Because you say so? There are already *is* a border between Scotland and England, you know. They are and have always been different countries. The SNP didn’t invent this state of affairs, they simply argue that Scots, if given the full powers of autonomy, would make a better job of running Scotland. Why’s that somehow nefarious? How do you know? Even if you are right – which I don’t think you are – the motivations for a government pursuing a pro-immigration agenda are irrelevant. The sheer fact of them doing so is almost miraculous given the furiously anti-immigration rhetoric which dominates the political and media sphere. No ‘exclusion’ here. Sure. But why do anti-immigration parties and policies poll so well there? Despite electing governments which have wildly diverging views on almost all the main social and economic issues…. When? Give me an example. Again: how do you know you? You agree that he should resign, yet still ascribe the poorest of motives to others seeking his resignation while ascribing the loftiest to yourself. It’s got nothing to with with an ‘intolerance towards plurality’ and everything to asking for honest political representation. Who are showing no inclination to punish him whatsoever. That’s why this is happening. Shaw, you clearly wrote, ‘You have divided Scotland.’ Now, you seem to be agreeing that Scotland was divided long before the indyref came along. Great, so stop blaming Yes supporters for it then. Well, if voting patterns have changed then that obviously means both the people and the country have changed. Voting patterns aren’t some abstract thing divorced from society. They don’t alter unless there’s been a fundamental shift in the people themselves, much as you clearly wish it weren’t so. You seem to have missed the point. In fact ‘whatabootery’ reinforces the point. The simple fact is that in Scotland today since the indyref, many feel alienated, especially those of a more cosmopolitan inclination who can’t get behind the ‘nationalist’ construct that dominates, however justified it claims to be or how often it uses other social issues to disguise it’s true fundamental raison d’etre. Gender equality is a cosmopolitan construct and is univerally being pursued across all liberal democracies, some are more advanced than others. Using it to deflect from other reactionary exclusive agendas is facile. As for immigration, the motive is primarily economic not social and again used to deflect from another ‘fundamental exclusive’ agenda. Point at England, which incidentally, although not perfect is one of the most progressive countries in the world with regards to plurality of culture, race and custom – there are more inte-ethnic marriages in SE England than anywhere in Europe – and say we’re not like them. It’s an absurdist position to take. As for the third option I agree, the conservatives should have allowed a third option but that is history, now in the past. The ref was lost and what is really needed is a unifying constitutional convention that seeks a federal ‘inclusive’ solution that empower Scots, the North etc while avoiding the divisiveness of Independence. but what do the SNP do? They turn up wearing the ‘white rose’ and indulge in petty anglophobia. I wonder how the English in some of their constituencies feel? Oh and there’s the witch hunt for Carmichael, which (despite it being correct that he resign) is clearly motivated by a very worrying intolerance towards political plurality. The witch hunt is worse than the crime as far as wider society and democracy and inclusion is concerned. Leave it to the parliamentary authorities? The primary purpose of a liberal democratic system is to manage/ accommodate division, not to exacerbate it to the point of exclusion which is what is happening in Scotland. It’s precisely because divisions exist in society that common ground is sought to enable some social cohesion. There are those who seek overcome divisions and find solutions, to unite as a tool, and there are those who seek only to win and divide for the some at he expense of others. One side wins the other looses. Thatcher was the latter, Alex Salmond is the latter etc. The independence referendum, due to the fundamentalist nature of the question Yes/ No and the inescapable circumstances in which opposing groups interact – two equally justified outcomes (even though there are multiple other options possible) was highly divisive in a very profound way. To pretend otherwise is either niaive or cynical as it suits a certain self serving ‘one sided’ narrative. If everyone followed the rationale of your statement ‘society is divided get used to it, lets not address it’ then history would lose most of it’s great figures. Those who rose above division with vision. Take your pick. Who do you prefer Mandela or Mugabe? Really? Who is being ‘excluded’ in Scotland, where the government is pro-immigration and has a 50/50 gender cabinet balance. Might I point out that Salmond – who you point the finger at here – fought for a third option of ‘more powers’ on the indyref ballot paper. It was the Unionists who insisted on a straight Yes/No choice, and therefore a binary division. The UK govt is disallowing European residents in Britain a vote on EU membership. The SNP allowed everyone living in Scotland – regardless of where they were born – to vote in the indyref, even although it might’ve cost them victory. So who is ‘accommodating’ division and who is ‘exacerbating it to the point of exclusion’? That’s your opinion and you are welcome to it – it does sound like you want to shut down people who disagree with you and who are also entitled to their opinions. The unresolvable problems with federalism are immense. There is no appetite for federalism in England, nor will there be. Despite wanting to shut down voices arguing for self-determination you then argue: “there’s the witch hunt for Carmichael, which (despite it being correct that he resign) is clearly motivated by a very worrying intolerance towards political plurality.” We can (and should ) have pluralism in Scottish politics whilst still having a basic level of decency in public office. I look forward to the pluralism of the Greens, socialists and whoever else gets elected next year – that would really enrich our political life and quality of debate. A) There have been multiple Federalist options/ constructs muted, not just four ‘nations’. In fact the city regions is taking off rather well. B) Kil report is not remotely relevant to today. C) Other countries have weighted federal systems that work fine, some of which the UK designed. D) Both independence and full union will only be successful if there is an overwhelming majority either way, so the wisest course is compromise. This is not shutting down debate. D) Public standards are important, like not deliberately misleading the electorate by repeatedly insisting that Labour had voted for 30 Billion in cuts…but Carmichael should go, but not at the behest of the SNP supporters and crowdfunded witch hunts that undermine the democratic purpose and bring a culture of litigation into the electoral process. F) Self-determination is fallacy in the modern world, especially Europe. Quasi federal structures are the only way forward, not through choice but through economic/ technological/ social logic. I’m almost afraid to ask given the gusto of your comment but have you any opinions regarding the other aspects of the article? I’d say Carmichael should stand down, triggering a by-election. It would then be up to him if he wants to simply resign, and an alternative candidate from his party can stand in his place. Or he could chose to stand again, in which case the electorate can judge him and decide if they still want him to be their MP. Yeh, but no more than England, (or any other country), is divided! Besides, #CarmichaelMustGo is currently uniting many in O&S: they have every right to be outraged that their votes were obtained by outright deception! Scotland HAS changed beyond recognition, and you only have to live here to accept that’s absolute truth. Voting Yes may have brought an end to the Union, but you fail to understand that’s not where grassroots support grew from. It was more about creating a society that looked after its vulnerable and shared it’s wealth with the many – not the few – and less about animosity towards our family, friends and neighbours south of the border. Why would ending a political union change any of the social or other ties that bind us??? Thats absolute nonsense created by the msm and unionist parties. The animosity now felt towards unionists was created by the unionists themselves, but it doesn’t extend to the ordinary folk living across these islands. It’s a little tragic really, the whole fantasy ‘self-determination’ thing given the inescapable nature of the modern world. Unless Scotland comes up with a currency solution (which it can’t) there will never be a Yes vote. End of story. I bet in 40 years time this site will still be discussing the same things round and round, stuck in a time warp like forgotten Japanese soldiers who won’t come out of the jungle because they still think WW2 is on. Scotland is uniquely unable to hold any control over it’s own affairs. Interesting. In your mind is there no discernible policy differences then between Zimbabwe, Denmark, Greece, Iceland and China? How’s the bamboo hut coming along, better make it sturdy, your going to be in it for a while. Scotland does have control over it’s affairs, more than any joint legislature in existence. It’s about spheres of influence, why Denmark is creating a Skane/ Copenhagen cross border city region (federal) system also. Why China is in fact expanding Imperially and includes 52 ‘official’ nationalities within its borders. Why Zimbabwe is run by a despot who uses tribal/ national differences to divide and rule. Greece independent! able to follow own policy agenda…hahahaahahahaha. Sure. I’m not the one making the wild, baseless claim that Scotland has someone how been unified since September 2014 – it hasn’t. No, people’s voting patterns have changed. The people have not changed and the country has not changed. If you think the oilmen of Aberdeen, the financiers of Edinburgh, the developers of Glasgow, the central belt commuters of Stirling and elsewhere, or the majority of ABC1s generally are genuinely interested in this, or are genuinely prepared to give something up and make the sacrifices necessary to make that happen – you are living in a fantasy world (I expect this is the case). I have and continue to visit Scotland several times a year to visit family, and I’ve been varyingly concerned, disturbed and appalled by what I’ve seen. I’m very happy with the decision I made a long time ago to get away from you. Yay for One Baw Shaw/Corporatist Hell – he’s back and it seems he’s madder than ever, which must mean we’re doing something right. Keep it up OBS as I do so enjoy your posts, although the thought of all that spittle on your monitor is a little off-putting. Incidentally, as an “oilman of Aberdeen” I’d rather you didn’t presume to know how I think. I know plenty of other “oilmen” (we never use that term by the way) who are interested in politics and self-determination including many who would, and already do, happily sacrifice some of their income in the hope of creating a fairer country. But then you don’t like hope do you. Finally, have you any idea how funny your comment is that “I’m very happy with the decision I made a long time ago to get away from you”? It’s brilliant, I had to wipe clean my monitor after reading it. You say voting patterns have changed, people have not changed and the country hasn’t either. The voting pattern changed at GE15 because SNP now represent those same old values Labour once did. Indyref found Labour out: they showed their true colours, back then and since. The truth of what they have become has been hard, and it’s still sinking in. Labour insulted many Scots, and paid a fair price. More than half Scotlands voters chose to stand together, in solidarity, against ring wing policies. That’s the change. Rather than dividing, socialists have united. Many oilmen, financiers and developers may share your selfish ethos, but plenty others wish to see their country and communities thrive, see warm well fed kids, and recognise the utter failure and affront that is austerity. So in answer to your question, are people genuinely interested and prepared to make sacrifices: yes, many are. They still want the best for their own families and kids, but NOT AT THE EXPENSE OF OTHER PEOPLES KIDS. That’s the crux. The need to invest in a nationwide industrial policy that creates skilled well paid jobs, supports small and medium businesses, grows the economy, and ensures corporations pay their way is sound economics. It’s about creating a system with balance, fairness and a commitment to looking after each other. The billions saved from trident, and closing loopholes that facilitate tax dodging and evasion, (deliberately built into law by corporate puppets at WM), will be a nice wee bonus when independence comes. If you think the Union will go on and on, then you’re the one living in fantasy land! The corrupt WM system, that encourages greed and covers up paedophilia disgusts me and others. MPs who lie to win elections will no longer be tolerated, and plenty have donated their hard earned cash to pay legal fees and ensure Carmichael goes. When’s the last tjme you heard of something like that, anywhere in the UK? Indyref drew our attention back to politics, we educated ourselves and each other, (and continue to do so), and our eyes are now wide open to the truth behind WM, the MSM, and their corporate masters. We can’t go back, because we cannot unlearn what we now know. You may have visited Scotland plenty, but I trust your relatives are the same ilk as you, hence the fact you’re concerned, disturbed and appalled. Almost half of Scotland also fear the break up of the union; unsurprising when gov and media combine to deliberately lie, and scare the crap out of vulnerable terrified pensioners.Cruel, callous amd disgusting. Some Scots will always want to remain part of the Union – I accept that – but for others the price is proving too high. Our own Scottish gov are way more trustworthy than WM, and that message is getting through. We are making sure it does. Next time you visit, remember you’re only ‘mixing’ with those who share your own views. But if you care to look beyond your own nose, (or just stand around a glasgow pub listening to passionate political discussion), you will see the truth for yourself. We’ll be even more united if Manchester and the rest of Northern England decide to join with us, Corporatist Hell. Why would Manchester want to ‘join’ Scotland? What have you got to offer us? The city (region) is doing extremely well, has been for more than two decades, and will continue to do so. Why would we want to disrupt our progress by getting involved with your crazy culture war experiment? And Greater Manchester is changing. Five Conservative MPs now (predominantly in the most affluent, wealth generating parts). Our functioning economic area is working. And in fairness, even the city-region leaders (who are often ‘Labour’) now state openly that Labour, as in the Labour Party, are becoming part of the problem, not the solution. I mean, if you want to take on the burden of the likes of Newcastle, Middlesbrough etc. then be our guest. (You are welcome to Liverpool as well – I’ve no love for the place). And Blackpool, take bloody Blackpool – to this day I understand thousands of your lot swarm down to that dump to take a fortnight’s holiday, though God only knows why. Take a look at the political map of the affluent rural parts of North of England. Conservative. They’ll want nothing to do with you. If anything, people in the wealthy rural borders constituencies might want to come to England. You’re up there with Michael White when it comes to smug condescension, Corporatist Hell, but – to borrow a phrase from Jill Stephenson – you’re not very bright, are you? JBS, my thoughts exactly. Mr Baws sneering style is very reminiscent of those that populate the news threads of the Torygraph. I stopped hanging around those types of places last year, as it soon becomes clear there really is a ‘type’ that consider themselves superior. Well at least 30000 Mancunians have signed a petition to join up with Scotland. Were you not one of them? On one hand the SNP are criticised for irreparably dividing the Scottish electorate, while on the other decried for seeking to forsake pluralism. Both of these reactions are hysterical hyperbole. Every truly democratic country is, by definition, divided. Pluralism is the availability of other feasible options, not the requirement that they be accepted. The narrative that the SNP are somehow to blame for the ineptitude inadequacy and plain unattractiveness of the alternative options, is patently ludicrous. The SNP are not any more or less inherently divisive than any other political party, just more successful. If England votes 55/45 either for or against Brexit, have the Conservatives therefore riven the nation in two? Or is this kind of result only to be expected, and kind of the point, of a referendum? Sure, all political parties are divisive, but there are degrees and there are qualtitative and qualitative considerations. Division can be a unintended/ unforeseen or it can be the defining aspect. The SNP are by definition divisive because their fundamental raison d’etre is ‘division’ ont he basis of things people can’t help, thing that are innate. In order to deny this you have to have a prediliction to that division in the first place. Many don’t, many see the cultural/ social and economic divide between the people of Britain as false and corrosive. Others see the divisions as self evident. But you cannot escape the exclusive nature of the latter. British Nationalist/ English Nationalists who want a ‘Brexit’ are qualitatively the same as the SNP. Those who seek compromise and new inclusive structures based on the maximum cosmopolitan outcome are the less divisive. This has nothing to do with pluralism and plurality of voices. I didn’t claim that this was about plurality, but was simply pointing out the inherent hypocrisy in criticising the SNP for dividing Scotland and also for having overwhelming control over Holyrood and the Scottish Westminster delegation. The SNP received 50% of the popular vote in Scotland, the Conservatives 37% in England. Why is a 50/50 split more divisive than a 37/63? Anyway, just because a group of people hold a different opinion to you doesn’t mean that they are being divisive, any more than you are being divisive for not agreeing with them. It is the issue that is divisive, not the SNP! The most recent European independence referendum other than Scotland’s, or Catalonia’s quasi-official one, was in Montenegro in 2006. The result was 55.5% Yes (to independence) and 44.5% No. Those who were born in Scotland actually voted 53% in favour of independence. It was the sizeable minority of those UK citizens born outwith Scotland who actually swung it for No (they voted 73/27 against). As an example would you call a 50-something who was born and raised in Hampshire all his life, and had only moved up to Scotland in 2013 a Scot? One ball. With all due respect, you know nothing about what’s happening here. Pay attention, Mr Baw, when was the last time you saw a crowdfunder to launch a petition against a lying politician? You don’t think that’s political engagement from an electorate sick of shoddy behaviour, and looking to take matters in hand? Good piece, Mike, Mr White may have missed his meds or something, but his performance was a sight to behold. I’m sure the upside to his sneering, is that the crowdfunder took a leap. The response to the Carmichael farce is nothing to do with SNP, or its supporters, but a lot to do with people who are sick with people like him, White and the MSM, believing they are subject to a different set of rules, which is devoid of common decency. I have stopped watching TV but saw the clip of White with Lesley Riddoch posted on Twitter by Wings. I was stunned. If he writes for the Guardian, which I read for 20 years until last year, then things have really moved on…….White seemed like an Inspector in the 1950’s Colonial Police……..is it me that has moved on or is the Guardian turning uber-Unionist? It is only a matter of time before Scotland is independent. Google, “Pinto Colvig, the 1st Bozo the Clown” for Michael’s real day job. Silly us. I realise now that what we really need is someone who does not live here telling us what we are or are not, again. Someone obviously with no idea about the culture, social fabric or perspective of a place with the maturity to have a full on and scintillating political conversation with itself, make a split decision, then come together under a compassionate and progressive banner for more powers. What is wrong with the media why can they not understand enough is enough.we want honest politicians honest journalism we don’t want Westminster high jinks &trickery.i feel very sorry for the folks in the northern isles &can’t understand why Alistair Carmichael doesn’t resign it would be the honourable thing to do. Yes to that. Too many liars in the media as well. Just reading GA Ponsonby’s book on how the BBC stole the Referendum – horrifying!! One Baw Shaw and you maintain that the referendum was conducted in a fair and open manner?as for the SNP having only 50% how does that compare with dodgy daves/Ed the talking horses %,s? The bit about the ‘SNP poets’ was hilarious. Does that make all those who voted SNP poets? I hope so…. I liked that too. A Nation of Poets. When I was a student in the 70’s I used to buy the Guardian as I wanted to be seen as a Socialist, and indeed, if I remember correctly, it was a reasonably left wing paper. I now buy it only on a Saturday and don’t read the main section, only the Review and Sport, and read the National instead. Under Rusbridger it has become increasingly right wing over the last 20 years and gave us no support during the referendum, quite the opposite, and although not as rabidly right wing in its treatment of the SNP and Independence as the Torygraph it still managed to succumb to the Unionist lying machine. I have grown tired (and angry) at many of their columnists condescending, holier-than-thou, sneering tone and will never read them again. As the Bella article suggests many of the metropolitan (and Scottish based) commentators are floundering in the new reality, because they have nailed their colours so firmly to the mast of a dispensation that no longer exists, if it ever did, and now cannot accept how the world has moved on. It’s like the scientist who having spent his lifetime’s work developing the phlogiston theory cannot accept that it’s total bunk. The likes of White cannot see that Carmichael’s case is like a dramatic Tragedy. A man brought down by a fatal flaw – an overweaning hubris. Some say he was a good local politician but the dawning horror of an overwhelming SNP victory caused him to take leave of his senses. Bad enough, but to compound it by successive lies, knowing he would be found out, and so put himself forward for election under false pretences was inexcusable. Any honourable person would have resigned and submitted himself to the electorate again. I think it was more the horror of the loss of a place at the trough which did that. Maybe it is best to ignore contributions from this source……..what responses could anyone possibly make that could influence him given his months of obsessively trolling this site. I hope you are looking forward to the renewal of Trident – which with a Conservative government in power (and many Labour MPs also support it) – IS going to happen. You will not be having another referendum any time soon, or ‘independence’ any time soon. Indeed, what is more likely to happen is that Scotland will be offered FFA or something similar, in return for a pledge for no new referendum for at least 10 years, and acceptance of the renewal of trident. Of course, in Scotland, about half of voters want to keep Trident and keep it in Scotland. So ‘Nicola’ would be faced with the choice of rejecting FFA on point of principle re. trident (which only half of Scottish voters are against) where ‘taking control of your own economic (and other) affairs’ is one of the key reasons for voting SNP. Trident WILL be renewed, and it WILL remain based in Scotland. So all those demonstrations you’ve attended and all those hours spent pounding the streets campaigning will have been utterly futile, and will count for nothing. Though, as I’ve said before, you are welcome to declare UDI in an attempt to remove Trident. (Let me know if and when that’s going to happen, I’ll want popcorn). You are shouting into the wind. Independence, or at the very least a Federal Scotland, is inexorable. It’s just a matter of playing out the string. Remember when devolution was supposed to stop the independence movement dead? How did that work out? The referendum was lost, so it’s back to piecemeal. Inch by inch it is happening. People on both sides of the border are getting used to the idea and, as they do so, and as the older generation with emotional ties to the idea of Great Britain grows smaller, and as English MPs court votes by taking a harder line against Scotland, and as the two counties grow ever more politically and ideologically disparate, it will happen. History takes its own sweet time and will not be rushed, but it gets there. Possibly. Despite the lack of a real exit poll, the analysis that has been done indicates that the less affluent you were, the more likely you were to vote Yes, and vice versa. So lots of Yes voters were people who thought “it can’t be any worse than this” (it can always be worse) and / or I have little / nothing to lose. And lots of No voters were people who thought there were too many unanswered questions and the concern about the risks outweighed the leap of faith required about the potential benefits (I am doing fine / well and I am not risking what I have). Lets see what happens as the economic conditions and wider circumstances continue to improve over the next few years. “at the very least a Federal Scotland, is inexorable”. Maybe. By negotiation, presumably? (You can have your ‘independence’ via referendum, or via UDI, if you so chose). The price of that Federalism may very well be a renewed Trident remaining on the Clyde. If you want FFA etc. and Federalism (one negotiation point will be) Trident stays. We’ll see how long Nicola holds onto her ‘principles’ over Trident when control over your own economic affairs is on the table. My God! Here speaks a person so bitter and twisted it’s like having Auld Nick himself chipping in to the debate. You may be doing “better than most” financially Mr One Baw, but your soul departed some time ago. I truly pity you. It’s not Auld Nick, just a narcissist who has been allowed repeated opportunities to indulge himself by getting attention regularly here under a string of bumptious names. He is not really interested in Scotland or politics…….he is only interested in drawing attention to himself and how uniquely intelligent and worthy he is……he is probably trolling trainspotter sites as well. It is essential that he heaps abuse on others to feed his self: hence the provocation that he indulges in weekly. The thing that really gets to a narcissist is to ignore him (frequently it is a “he”)…..
As I said above, I am away for a while. I do hope Bella sorts this chap out. There is so much great new alternative media around presently. Clearly this is a minor distraction for Bella………but I find it both toxic and unnecessary. Most of these politicians and paid hacks are beyond the pale. It is not that they cannot comprehend what is taking place in Scotland. It is a case of they refuse to comprehend what is happening in Scotland. Denial is a defence mechanism. All the stops are being pulled out to make this into a SNP bad story, and have this scandal buried as quickly as possible. The silence of the opposition parties. The refusal by the media to give the story legs. The outragous arguments being put forward by politicians in defence of Carmichels actions. The weasel words contained in the civil service report. This is a system scared to death and at the end of its tether.. If the people succeed in removing Carmichael then a precedence has been set. We could just be about to witness a politician being held to account for his actions by the electorate despite the best efforts of the state machine trying to prevent this happening. Imagine that! It must be frightening the beejeezuz out them. Is it true that Alastair Carmichael has put his name forward to be the next President of FIFA? Carmichael has all the attributes needed to succeed and thrive within FIFFA’s culture.